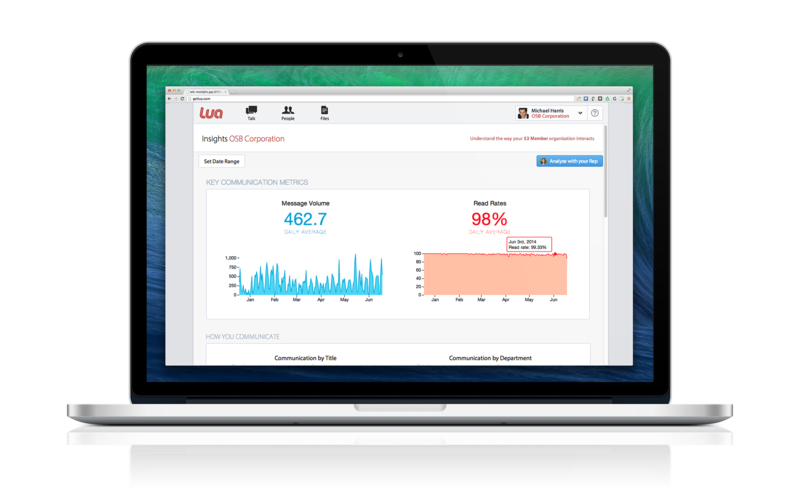 Lua, the mobile first communications platform for any workforce, has today launched a brand new feature of the product called Insights. Insights is a metrics platform that will allow clients to see in real-time the way that their employees are communicating and gauge that against the success of the company. Lua launched back in 2013 out of TechStars to bring better communication tools to mobile workforces: People who work in construction, on movie sets, in hotels or large venues. But even when they launched more than a year ago, Lua had Insights in mind. The plan wasn’t just to make communications easier, but to actually improve the quality of the business through those tools. And the best way to do that is to look at the data on how they’re working. Insights allows clients to see daily messaging volume and responsiveness, communication patterns across various departments and roles, as well as activity hotspots to show which places and times saw the most comms activity among employees. Lua’s current pricing model costs $6/per user/per month, but is now introducing a Professional tier that costs $10/per user/per month. That plan not only includes the new Insights tool but dedicated customer service support from Lua itself. Back in May, Lua raised $7.5 million in Series A led by Abundance Partners with participation from investors like Strauss Zelnick and Aaron Stone. That brings Lua’s total funding to $10 million, according to Crunchbase.